We don’t often dine out, simply because we prefer to cook at home: it’s less expensive, less caloric and more satisfying. The only real exception is sushi, which I don’t attempt to make. But, if a restaurant menu offers “seared tuna,” then that’s usually my selection! I like it served cold (our local sushi restaurant makes a killer seared tuna salad with creme fraiche and wasabi dressing), I like it served warm (over pasta, rice, or soba noodles), and I feel great after eating it. Seared tuna is a fantastic, weeknight-friendly dish: ten minutes tops from the refrigerator to plating. I slightly adapted this recipe from “The Improvisational Cook“, by Sally Schneider, and served it with a crispy potato / spinach / escarole salad based on this recipe. 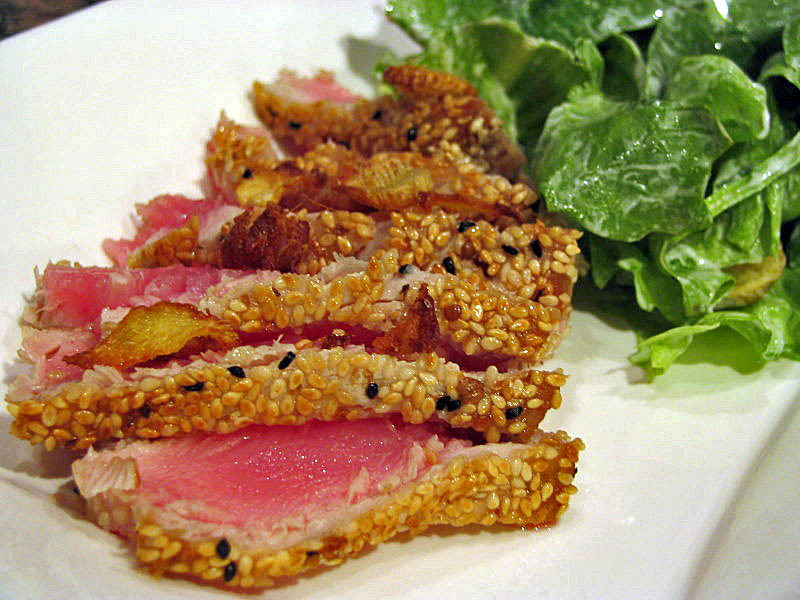 It’s a healthy, tasty dinner, that reinforced my infatuation with seared tuna. Heat the oil over medium heat in a small saucepan. Add the ginger slices and cook over low heat for 7-8 minutes until the ginger is crisp. Transfer to paper towels with a slotted spoon, season lightly with salt, and reserve the ginger slices and the oil. Place the sesame seeds, cracked coriander, and nigella seeds in a plate. Season the tuna steaks with salt and pepper, then press both sides of the steaks on the seeds mixture. Heat the ginger oil in a non-stick skillet until hot, but not smoking. Place the steaks in the oil, and cook for 90 seconds on each side for medium-rare. Transfer to a cutting board, slice with a sharp knife, scatter the crispy ginger, and serve. Comments: If you can’t find top-quality tuna steaks, then don’t attempt this recipe. The fish will be nearly raw in the middle, so only the best quality tuna will rise to the challenge. If you prefer it a little more cooked, then give it an additional 30 seconds on each side, but avoid over-cooking. To crack the coriander seeds I placed them in a small ziplock bag and used a meat mallet. Be gentle because they crack easily; you don’t want to turn them into powder. Other mixtures also work well, like cracked black pepper or mustard seeds. Nuts easily burn, but the searing takes less than 2 minutes, so it’s not a problem as long as the oil isn’t smoking hot. I’d never tried crispy ginger, and my husband thought it was a bit strong, but I liked it a lot. Cut the slices as thin as possible. The mandoline didn’t work as well as I’d hoped, so I ultimately used my chef’s knife. Amazingly enough, I still have all ten fingers. 😉 Even if you don’t like the fried ginger, it is worth making it for the infused oil. And now for something completely different…. savor this!